Daphne’s English family was a sort of consortium that owned the Gang Ranch in BC’s Interior. During the years of the Second War her father was the Ranch Manager and she lived there through her teens. 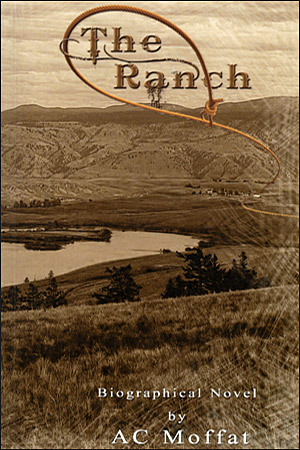 The real ranch was, indeed, one million acres — owned and leased. A size well beyond the imagination of most! While this does not pretend to be the story of the Gang Ranch, the thread of the story — and most of the specific incidents — are true and patterned after the Gang and Daphne’s personal experiences during her years there. Some characters are based on real individuals [such as the Chinese cook Hoi] and others are fictional [such as Old Bill] so as to fill out the story. The incidents and the time frames have been freely altered in order to fit the story. They have not, however, been distorted intentionally and the thread remains factual. Although this is only a Novel, it is an historical Novel and to a large extent biographical as well. It is hoped that the “feel” of the ranch as Daphne knew it will come across to the reader. Two days up the River and Old Bill brought them to a halt. He had seen what John had not… a whiff of smoke up ahead. Now, John had seen Indians around Kamloops and he had heard lots of stories about them — good, indifferent and some informative — but he never had an opportunity to actually meet and talk with an Indian. The prospect excited him — one more new item to add to his ever-growing mental diary! They approached the Indians’ camp with Old Bill calling out a loud “Hello” from afar. “Jes ta let em know company’s comin’,” he explained. As they entered the Indians’ campsite Old Bill greeted the Natives in their own tongue. There was a great deal of laughing and backslapping! John smiled to himself — was there nothing the old bugger couldn’t do? Nothing he didn’t know? When greetings were over and introductions completed, Old Bill boiled a pot of coffee on the Indians’ fire to share with the locals. Then he and John built a small pine bough lean-to, opening onto the fire pit for night warmth.